I just finished the life of Solomon, in II Chronicles. Although this was a very brief snapshot of his life, the details of the Lord's Temple were amazing. This scaled drawing, from my new ESV Study Bible, gives us a scaled representation of what this structure must have looked like. The place was dripping in pure gold. So wealthy, was Solomon, the Bible says that pure silver was as a common, and plentiful as a common stone. I am finding that my ESV Study Bible Reading Plan is a great tool to make my way through the Bible. This tool has become a treasured resource. We just finished watching "God's Outlaw", a movie about the life of William Tyndale. The quality of the movie was fair, but I thought the portrayal was fair and from a friendly viewpoint. Tyndale was a contemporary of Martin Luther, and was responsible for translating the Bible, from Greek and Hebrew, into the English language. Now that the Gutenberg's press was nearly a century underway, Tyndale was able to mass produce his new Bible and smuggle them into England, from his hideouts on the European continent. Tyndale was born in 1494 and was burned at the take, in Belgium, in 1536. Tyndale's dying words at the stake were reported to have been, "Lord! Open the King of England's Eyes". His prayer came true as only a short while later, King Henry the VIII ordered that Tyndale's English Bible be prominently displayed in all the churches of the land of England. The Reformation gained great strength in England with the common man having access to God's holy word in their native tongue. The William Tyndale story from Fox's Book of Martyrs. 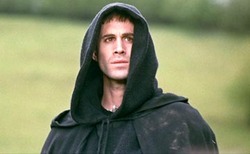 I just finished watching a 2003 movie on the life of Martin Luther. This production was far more "Hollywood" then other such productions I have viewed. It stars Joseph Fiennes, Peter Ustinoff, and Alfred Molina. The movie itself was fairly dry, but the cinematography was beautiful. Nonetheless, the movie makes an easy peek into the life of Martin Luther. Martin Luther was a Roman Catholic Monk born in Eiselben, Holy Roman Empire (this town is now in Germany), in 1483. As a monk, Luther attempted, through works, to find his way into God's good graces, but only found himself despondant as he looked upon his continued sin. On a trip to Rome, Luther witnessed the corrupt sale of indulgences and found people seduced into giving money to the Roman Catholic Church to get dead family members out of purgatory. This spectacle incensed Luther and the Protestant Reformation found its beginning in his anger with the church. Luther went on to protest the corruption of the church which ultimately lead to his excommunication. Luther is most famous for nailing a copy of his 95 thesis to the door of Castle Church in Wittenberg and thus giving birth to the Reformation. Luther argued that it was by faith alone that one found salvation and not by the selling of indulgences or many of the many other works oriented dogmas of the Roman Catholic Church. Luther was also responsible for translating the Bible, from the Greek, into the German language so that all the common people had equal access to the word of God. His was a remarkable life and he left an indelible mark in the history of the Christian Church. He died in 1546, at the age of 62. I just finished watching a 1984 movie on the life of John Wycliffe. Although the quality of the movie certainly wasn't up to Hollywood's standards, it was enjoyable and informative. John Wycliffe was born in 1320's England and died in 1384 at the age of 64. Wycliffe was a brilliant theologian and teacher at Oxford College. He was known as the "Morningstar of the Reformation" because of his persistent conflict with the Roman Catholic Church and his insistence that the church follow alone, the word of God, for its authority, and not the papal decrees of Rome. He opposed many of the Roman Catholic doctrines that conflicted with the Bibles teachings which ultimately found him excommunicated from the Church. 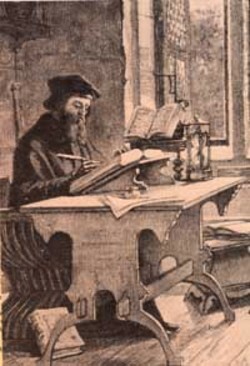 After excommunication, Wycliffe retreated to a country church where he pastored and created an English translation of the Bible directly from the Latin Vulgate. He put the Word of God directly into the hands of his contemporaries in their native tongue. This so infuriated Rome that roughly 30 years after his death, they dug up his bones, burned them to ashes, and threw them in a nearby stream. From this point on there remained strict religious discipline from Rome, one of Wycliffe's students was burnt at the stake, and there remained a huge Roman thumb on the Christian faith until the time of Luther's Reformation several hundred years later. It is disturbing to see contemporary Christians being persecuted in China and Russia. I can't begin to imagine what it must have been like to have such persecution coming from within those who call Christ Lord and Savior.